Just a quick Flannel Friday entry. Other people have shared lots of snowman flannels and rhymes in the past, and there are various ways to use these little guys, so I won't go into that. I wanted to share this because of the technique I use: Collage. 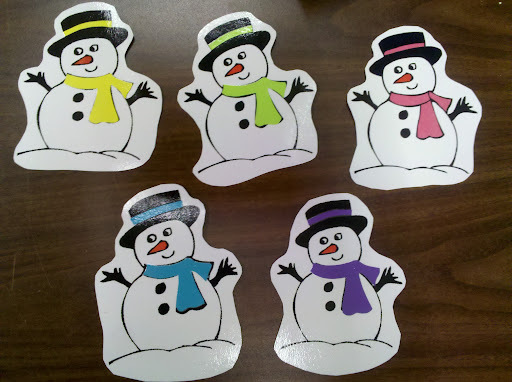 These are clip art snowmen, and were black and white--completely identical with no way to customize them before printing. After printing them the size I wanted, I used colored paper cutouts to add scarves, hatbands, and carrot noses. A little gluestick action and viola! Just print an extra and use that for a template if you're not comfortable doing it freehand like I do. They were then laminated. This technique is quick, easy, doesn't require special materials (like felt and extra sharp scissors) and works equally well for felt and magnet boards. I often use laminated pieces with masking tape attached to the back instead of velcro dots. It's removable and I think it works better than dots. This technique is a good option for those of us who don't have a lot of time! Flannel Friday is hosted by Angela this week, and look for it on Cate's blog next week. Almost every single "flannel" I make is of laminated paper pieces. I wish I could make the time to use flannel, but I can't. If I have time to personalize my flannel pieces, I often search for coloring pages, then color and laminate them. Love your snowmen! I use flannel and laminated...these snowmen are perfect...I love the way you personalized them. Thanks for the tips! My favorite is the expression on the snowmen's faces, and the way their arms are angled combine to make them look like they're dancing at a club. Or maybe it's just me?